So that was my first real visit to Asia. (I’m not counting a few day calls at Turkish ports on cruises – they’re Mediterranean, even if technically they were in Asia. And Istanbul is actually in Europe, of course.) I enjoyed it and here’s the usual ‘wrap up’ review and summary. The first thing to say, however, is that I found the climate very challenging. I spent much of the holiday feeling very hot and perspiring a lot. Fortunately the things I was doing and seeing were, mostly, sufficiently engaging to take my mind off this, to some extent at least. Though not always – for example, the walk around Fort Canning in Singapore was extremely hot, and actually it was just a walk around a park, so I was certainly aware of the heat and humidity that day. Many of the attractions (especially in Singapore) were in air-conditioned environments, so that definitely helped. Dubai was much easier to take – the temperatures were much the same (30º or a bit over) but the humidity was much lower so I felt a lot more comfortable. A pity, really, as I felt there was actually less there to enjoy. And of course that was in March, not mid-summer: I was interested to note that whereas in Singapore the ‘record high’ temperature never goes above 36º and the average temperature stays between 30º and just under 32º all year round, in Dubai the record high ranges from 31.8º (January) to 48.5º (July) and the average high figures between 24.2º and 41.4º, so Dubai in summer would be very different from what I experienced. Having dealt with my difficulties with the weather, let’s get onto the places themselves. I liked Singapore a lot – I can’t say it any better than that, but there was something there that attracted me. I got a strong feeling that in 1965 the people (or their grandparents) made definite, positive decision to create and live in a multi-cultural, multi-ethnic society, and having been successful in that, the positivity showed. And that wasn’t the only thing that Singaporeans have done successfully, of course – above all their economy has gone from being very small to being the 36th largest in the world by gross GDP measure, and somewhere in the top five by GDP per head. For a country that is the 113th largest in the world by population and which has no great amount of natural resources, that’s an astonishing achievement. Some of the sights I saw in Singapore were truly stunning; others, e.g. Little India, were more homely. It’s good to find a place that mixes both in this way. 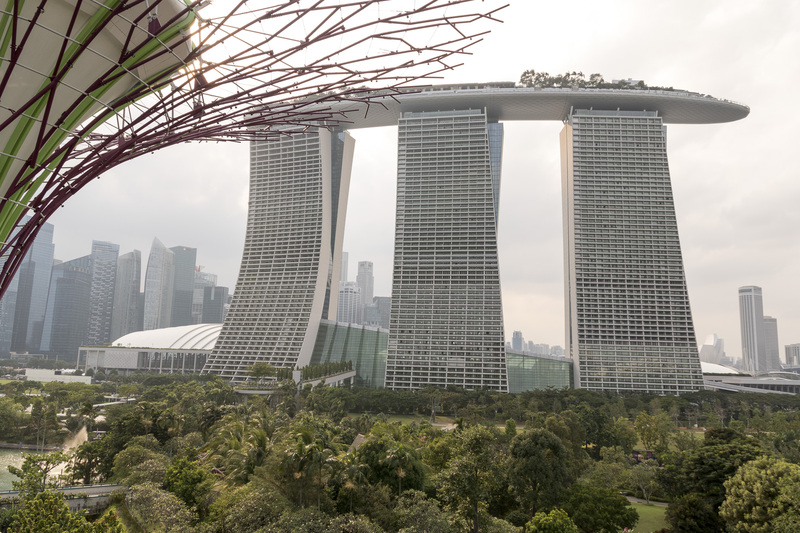 Of course Gardens on the Bay was extraordinary, but so too were the places in Little India. I enjoyed Singapore, even with the heat. Malaysia was obviously less developed than Singapore, although to be fair I didn’t visit their most developed location, Kuala Lumpur. I didn’t enjoy Batu Feringghi as a place, but the hotel I stayed in was good and I enjoyed the walks on the beach – but there again, a beach is a beach. I did get a relaxed feeling from the people – in general, there was a bit of a laid-back feeling. I also noted the wide range of islamic dress worn by the women – everything from what I might describe as the ‘full burqa’ to a simple headscarf and loose top over jeans to no islamic dress at all – and I got the feeling that the country was relaxed about it all. There certainly didn’t seem to be any public restrictions on what women could do – I saw women working, women driving, and women riding those incessant buzzy small motorcycles! Then there was Dubai. I didn’t warm to this place. You see very few UAE citizens – at least, not many people who dress like the illustrations, i.e. white robe, head-dress with dark head cord – so presumably everyone else is either a non-citizen resident or a visitor. Indeed, Wikipedia suggests that just 17% of the inhabitants are Emirati citizens while about 70% are from India, Pakistan or Bangladesh. So it’s definitely a country of ex-patriates, and it felt like it. There are some stunning things there, but I couldn’t help feeling that it’s lost its soul. The Dubai museum is full of messages about old Dubai and the old way of life, and the subtext I got was “life was good then despite the hardships”, yet the old life has disappeared precisely because of the actions of the government. The same sort of thing is true in Singapore, of course, but there the view is that the new ways are definitely better than the old, and I got that from the people I spoke to as well as from the official sources. I would like to go back to Singapore, I think, despite the heat, and maybe even Malaysia, but not Dubai. Here are some links. First, the posts for Singapore are here; start at the bottom and work up the list. Then the Malaysia posts are here, and those for Dubai are here.